CONICET’s researchers found hunting tools and bones of a giant ground sloth from about 12,600 years ago. 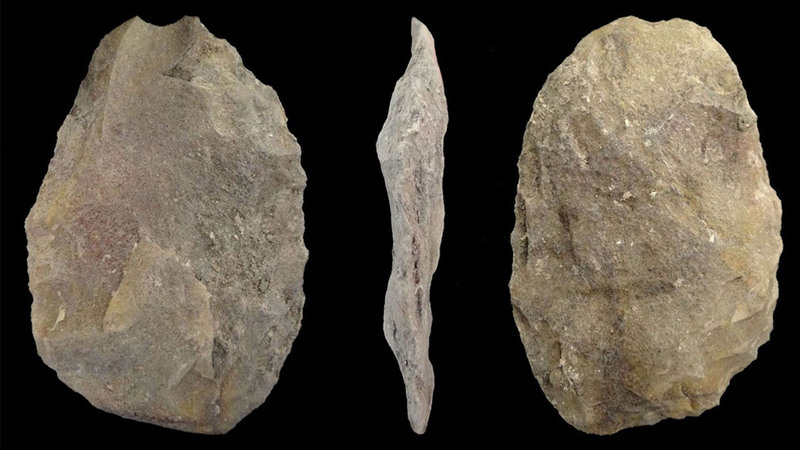 Stone tools found in Campo Laborde. Photo: courtesy researchers. The moment when the definitive extinction of the great mammals of the Pleistocene (which started 2,6 MYR ago and ended about 12 MYR ago) and the role of human beings in their disappearance have been controversial subjects between the archeologists and paleontologists from the American continent. Carbon-14 dating on extinct great mammals’ bones found in the Pampas region of Argentina suggested that some of these great mammals could have inhabited that area 8 thousand years ago, during the Holocene, several millennia after their disappearance in the rest of America. “The Pampas grasslands are thought to have worked as a refugium for Pleistocene herbivore megamammals and the indigenous peoples would not have hunted them intensely”, Gustavo Politis explains. He is a CONICET’s senior researcher and director of the Instituto de Investigaciones Arqueológicas y Paleontológicas del Cuaternario Pampeano (INCUAPA, CONICET-UNICEN) located in Olavarría. Nevertheless, a study published in Science Advances and led by CONICET’s scientists questions that hypothesis after a discovery along the banks of Tapalqué stream in Olavarría. It was there that a research team found the bones of a giant ground sloth (Megatherium americanum) and the stone tools to hunt it and butcher it. According to the date established by accurate methods, the remains would be 12,600 years old. “Several lines of evidence allowed experts to recognize the megatherium processing by human groups such as, for instance, the identification of the cut mark on the bones done with the stone tools and the making of instruments from the sloth’s ribs”, Pablo Messineo, CONICET’s associate researcher at the INCUAPA and author of Politis’ study, explains. The excavations were conducted in the site known as Campo Laborde. Thanks to a carbon-14 dating -in which experts had to employ more accurate methods to remove the collagen from the megatherium bones-, it was possible to obtain high quality and original information about the direct impact of the human groups on the species discovered in particular and on the megamammals in general. The experts managed to find dozens of bones of this specimen that was hunted and weighted four tons. “The Holocenic ages (under 12 thousand years) previously obtained were the result of degradation and loss of collagen in the bones and the contamination of the organic material from the sediments that rejuvenated the Carbon-14 ages, pollutants that could not be totally removed with the standard techniques to remove collagen”, explains Thomas Stafford Jr. from Stafford Research LLC (Colorado, USA), expert in Carbon-14 dating and another author of the study. Campo Laborde has so far been the only site in America where it was possible to document that old indigenous groups hunted this giant ground sloth. For Politis, the results show the role of the hunters’ groups in the extinction of South American giant fauna. “The new dating reduce around 2 thousand years the coexistence time between humans and megamammals in the Pampas of Argentina”, the researcher concludes. The study also included the participation of Emily Lindsey from La Brea Tar Pits and Museum (California, USA).